Ray the Blind Dog: PlayDate? Today I had to paint. It's been more than a year since the completion of the large, undisclosed- amount-of-money dog-door project and I still haven't finished painting all the things that need to be painted. I finished most of the projects but then was overtaken by events (my surgery, Gregg's cancer). So today was prime day. I decided that instead of taking Ray to daycare, I would go across the street and bring Maddie over to keep Ray occupied. I didn't know if this would work or not, because Maddie is more like Ray's older sister than a fun friend but I figured it was worth a try. Ray is always excited to have visitors and he tried everything he could to get Maddie to play (which, granted, is not much). He picked up a stuffed animal and shook it around. No reaction. He picked up his bone and carried it around the coffee table. No reaction. He dropped his bone in front of her. No reaction. I was feeling kinda bad for my blind hound but I had work to do so I headed to the garage to collect my supplies. Maddie followed. So did Ray. So trailed by two dogs now instead of just one, I carried my supplies upstairs. Maddie positioned herself in the place that she thought she would be the most useful. Ray, still with the bone in his mouth, stood in front of her, just in case she was going to change her mind and play with him. I explained to Maddie that maybe the stairs would be more comfortable for her than the hardwood floor. She took this piece of advice well and moved a foot to her left. Ray gave up and headed downstairs. Then a minute later returned (still with bone) to see if she had changed her mind. She hadn't. Ray headed back downstairs, dropped his bone and turned around to come back up. 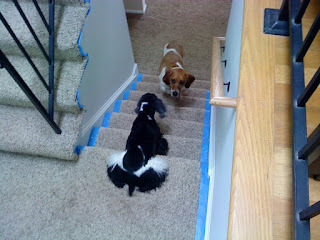 But by this time Maddie had moved to the landing and taken control of the staircase. Ray stood on the bottom stairs and whined. "Come on up, Ray," I said to the blind dog, "Maddie's not going to do anything to you." Maddie did not move and neither did Ray. And although Maddie had never done anything to him, Ray was not convinced that she wouldn't. After standing and whining for about five minutes, Ray turned and disappeared into the house. I gave him a couple of minutes, then, followed by Queen of the Stairwell, went in search of the big chicken. He was curled up in a little ball on his favorite pillow, on his favorite couch. I patted the other end of the couch, Maddie jumped up and companionably settled herself in for a little nap. I went upstairs to paint. It wasn't quite what I had in mind when I brought over another dog to keep Ray occupied but the results were the same. She does have interesting squiggly fur around her "edges". I was wondering if either of the dogs would end up with paint on them but was pleasantly surprised when I only found one faint spot in Ray's left eyebrow. What good dogs!